WELCOME! Libertarians (and our project) are persons pledged to advocate respect for rights, replacing coercive government with voluntary programs, promoting rights and the liberty thereof, hence the name. Libertarians work to promote the option of Libertarian (voluntary and non-coercive) solutions and societies from homes to nations. FLORIDA LIBERTY! joins the LIO and other E-Clubs to welcome everyone interested in human rights and the LIO approach. We help voluntary solutions and peaceful living...Are you already very Libertarian or Liberal-center oriented? Take the world's most popular free Quiz! ...plus go to the Club site for free Libertarian E-books! ...and send this site URL to friends to spread the good word! Check on the latest: join our reminder newsgroup and post your event or 'win' news. Florida--The Florida Liberty (FLLIB) is on an extended hiatus that will likely last into winter related to a search for a new Chief Editor, creating stories on the past Florida movement, editor health and other factors. It hopes to publish occasional personality profile and update articles in the intervening months. It generally issues a quarterly article or profile. Florida Libertarians are expecting a vote, are working on, or are preparing around several coalitions and initiatives. All have been approved by the LP Florida for candidate and activist use. Kennon Gilson, 17, here in county board chambers, is on several appointive boards, where he successfully proposes Libertarian tools--and says you can get involved. Walt, right, greets ABC celebrities at a promotional event. Pinellas Area Libertarian Community Project Starts Well; Called "In-Place Free State Project." Left: LIO Community users, coalition friends meet with media. Participants in the Pinellas LIO Libertarian Club and the Pinellas LP attended a workshop to launch distribution of a record 22,000 Advocates Tabloids and 100 windshield cards among other items, more than the rest of the country, say officials. Workshops will be held periodically. Tampa Bay--Paul Molloy's libertarian-friendly radio show, www.TheFreedomWorks.com has returned after a long hiatus, interviewing Libertarian experts and Florida activists in over 3 local stations and internationally via internet. Dr. Ralph Swanson, in his study, says "Get to Work"! LIBS IN PUBLIC OFFICE? SO EASY A TEEN CAN DO IT. Kira Gilson is congratulated by board chair for her draft fundraising guide to help privately support public trails. 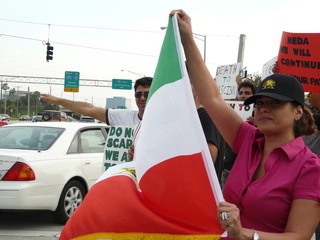 Libs across Florida are organizing or participating in protests and teach-ins on the situation in Iran. TALLAHASSEE, Fla. -- Florida won't appeal a federal judge's decision that struck down a law he said unconstitutionally limited political free speech. Secretary of State Kurt Browning initially had said he would appeal but has since changed his mind, spokeswoman Jennifer Krell Davis said Monday. In 2005 Libertarians and Democrats formed a coalition (http://www.ERCPinellas.org) in Florida to create better ballot fairness. One issue was fairer districts, and now a website is up so you can take action. Please take a moment at... http://www.fairdistrictsflorida.org/splash.php to sign the electronic petition and find out more. Florida has responded to the health care debate by working with private insurers to highlight low cost plans. The program, CoverFlorida, follows a lobbying campaign initiated by Florida Libertarians through the Club participants to remove legal redtape to lower cost private plans. The Clubs are non-partisan and do not do lobbying campaigns, but a call group has been formed by club members. Libertarian Florida activist Darrell McCormick has written a novel on Libertarian-oriented themes. It can be purchased at Amazon and as an e-book.